Marion District was formed in 1798, effective 1800, so the 1800 census was the first for Marion. In 1800 Marion covered a much larger area than today including all of the present day Marion County and Dillon County and about half of present day Florence County. This book contains a full transcript of the 1800 census but it also goes beyond that. I took each census entry and attempted to find other contemporary documents about that person. I searched for them on the previous census (1790) and the next census (1810) and if found, I noted where they were. I also checked the Marion District Deed Books for any entries in their name. I checked Equity and Probate records and other records from that era. 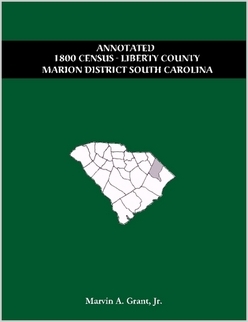 This provides a nice research tool and a cross reference for each person listed on the 1800 census in Marion District. It is not definitive, but is meant to provide a good start in finding other records concerning those "first families" of Marion District. Note, if you only want the original 1800 census without my comments and annotations, then I have that book also. Click here for more information. Edition: First (26 Dec 2003). If you wish to pay by check or money order you must order it from me via snail-mail. Send $30.00 to me at: Marty Grant, 3291 Alton Phillips Road, Kinston, NC 28504. The price for snail-mail orders includes shipping and handling. Once your check has cleared I will order the book for you and have it shipped to your address.